What immediately hooks you when you listen to Revolution Saints is the lead singer’s exquisite voice: gritty and frayed with emotion. Funny enough he is also the guy who gives each track its energetic drumline. It’s not every day you come across a singer who drums, or rather, a guy who made his name as a drummer singing, and singing well. Deen Castronovo’s extraordinary range of talents is just one of the things that make Revolution Saints a unique rock band. Another is the prodigious skill of Jack Blades who helps Castronovo out on lead vox on a couple of songs but whose mainstay is the bass guitar. He is also the group’s songwriter. 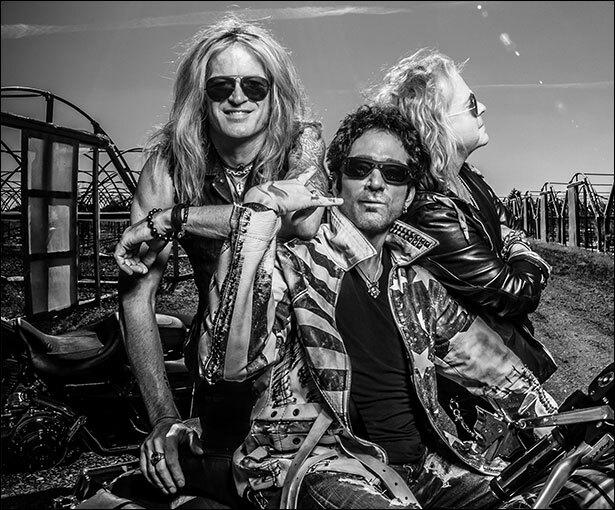 Completing the trio of talents that makes up the Saints is guitarist Doug Aldrich. He joined the Saints after a 12-year stint with Middlesbrough band Whitesnake. Revolution Saints is the realization of a long-held dream by the president of Italian label Frontiers Records, Serafino Perugino. Having worked with Castronovo, Aldrich and Blades on separate projects, Perugino always desired to form a classic rock group fronted by Castronovo. 2014 is the year it all came together and in summer the trio and in-house Frontiers producer Alessandro Del Vecchio headed to a studio in Portland, Oregon to work on their first project. On February 20th the trio will be debuting their self-titled album and it’s a day you want to mark in your diary if you’re into melodic rock with an 80s twist. But there’s much more to Revolution Saints than beautiful musicianship. There’s plenty of passion and overflowing positivity in each of the 12 songs. You won’t need to go much further than “Back On The Trail”, the album opener, to discover this. It’s a song that talks about being down, struggling for a long time, only to catch a second wind and find the strength to get back on your feet. There’s no warm up or drawn out intro, the guys jump right into it, wasting none of the four minutes of the tune. Castronovo floods the pulsating soundscape with his raspy vocals, working in tandem with Aldrich’s expressive riffs. You have to wait till track three for a change in tempo. And it comes in the form of the piano-led “You’re Not Alone”. Contributing to this uplifting number is celebrated Filipino vocalist Arnel Pineda. Pop-leaning as this tune is, it retains its classic rock roots and boasts an undeniable global appeal. “Don’t Walk Away” could have been a Bryan Adams hit a decade ago. This fluid ballad calling a lost love back home follows a pop song structure, never quite getting itself up to fever pitch, passionate guitar solo notwithstanding. It gives us the chance to see the extent of Castronovo’s vocal ability, which we hitherto only get long glimpses of. “In The Name Of The Father” provides a sort of fitting benediction to a remarkable album full of winners. Nothing less than 4 skullz does Revolution Saints justice! If you like journey, you’re gonna LOVE these guys. This album almost reaches back to the sounds of ESCAPE and Frontiers albums in Journeys heyday. Love Love LOVE this album and this new concoction of some of my favorite 90s musicians! Well done Deen and friends!